Savannah sparrows on Calvert Island beaches. Bottom right sparrow is foraging among washed-up kelp. Photos by Brian Starzomski. Due to a yellow eyebrow or spot in front of each eye, this small streaky bird is usually not too difficult to identify. Overall it is brown with white undersides. It has a relatively short, notched tail, and its small head is often topped by flared crown-feathers. Subspecies across North America vary in colouring: some are darker with more vivid yellow eye patches, while others are lighter with only a small hint of yellow in front of each eye. 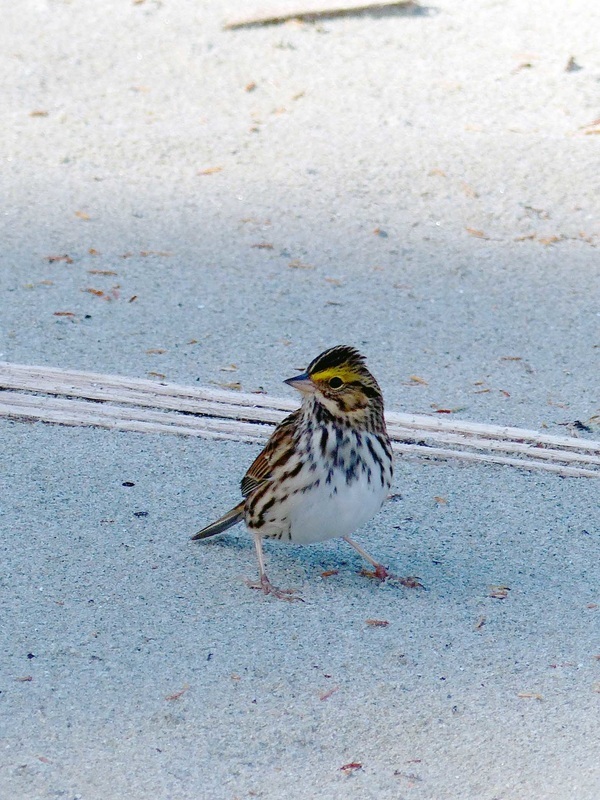 The savannah sparrow inhabits open areas such as meadows, marshes, prairies, and shorelines. Its summer breeding range extends across most of Canada and south into the northern United States. It winters in the southern United States, Mexico, and Central America. 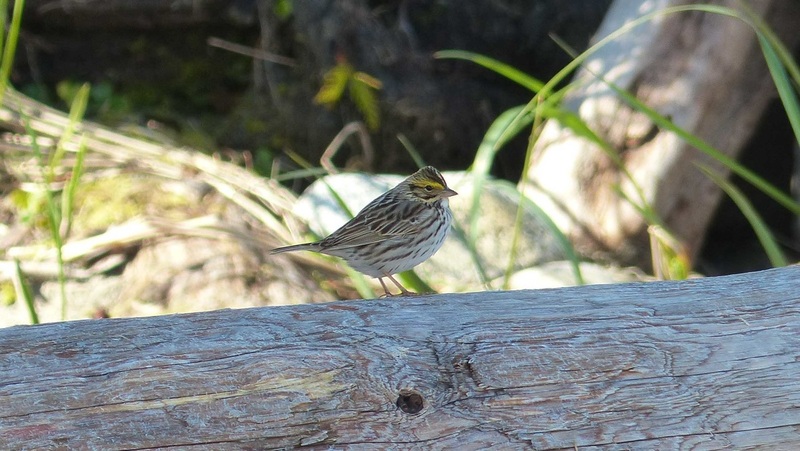 While most individuals migrate, the savannah sparrow is found year-round in a handful of locations, including southwest British Columbia. Individuals with a light yellow eye spot instead of the bold yellow eyebrow may be confused with other brown streaky like the song sparrow (Melospeiza melodia) or the American pipit (Anthus rubescens). The former has more contrasting brown and grey streaking, and the streaking on its breast is clumped; the latter is larger, more slender, and has a thinner beak. Savannah Sparrow. The Birds of North America Online (A. Poole, Ed.). Ithaca: Cornell Lab of Ornithology; Retrieved from the Birds of North America Online. Accessed 02/09/2013. Savannah Sparrow Passerculus sandwichensis. Audubon Birds. National Audubon Society. Accessed 02/09/2015. Dunn, J. L. and Alderfer, J. (Eds.). (2011). National Geographic Field Guide to the Birds of North America. (6th Ed.). Washington, D.C.: National Geographic Society. Pp. 472-473.